A litter of four perfectly precious french poodles are born, Fi-Fi, Foo-Foo, Ooh-La-La and Gaston. Mother Poodle teaches them the fine art of being a french poodle, to sip (never slobber! ), to yip (never yap!) and to walk with grace (never race!). No matter how he tries though, Gaston can not quite manage to be as perfectly poodle-y as his three sisters, but he works doubly hard nonetheless. On a trip to the park one afternoon, our Poodle family meets another dog family. A family of French Bulldogs, that also has four puppies, Ricky, Rocky, Bruno and Antoinette. They are brawny, they are brutish, they race, and they yap! But it is immediately apparent that there has been a terrible mistake, as the dogs all realise that Gaston is in fact a bulldog. And Antoinette is actually a poodle! The pups swap (that looks right!) and the families both go home. But Antoinette does not fit in with her sisters, and Gaston does not feel at home with his brothers. Both Mothers miss their children terribly and things just don't feel right. 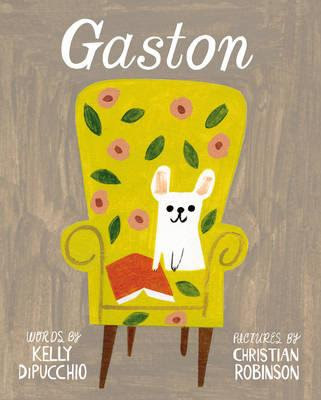 Gaston is a book with so much heart and warmth, with illustrations that would make a dog-lover out of any person, and a story that is both witty and brimming with love. The text is conversational, drawing the reader in and asking them to participate and reply to the questions posed. I must admit that it is undeniably such immense fun to say "Fi-Fi, Foo-Foo, Ooh-La-La and Gaston" over and over again!